Big Blue 1840-1940: Is the Minkus Supreme the "Goldilocks" Album for WW Classical Collectors? Is the Minkus Supreme the "Goldilocks" Album for WW Classical Collectors? "Once upon a time, there was a little girl named Goldilocks. She went for a walk in the forest. Pretty soon, she came upon a house. She knocked and, when no one answered, she walked right in. "Ahhh, this porridge is just right," she said happily and she ate it all up." And to stretch the metaphor, is the Minkus Global Supreme Album the "Goldilocks" solution for world wide classical era collectors.... not too hot, not too cold, but just about right? Minkus published their own world wide stamp catalog, and country and regional albums. The credit for the good attributes of the Supreme has to go to George A. Tlamsa, Editor in Chief of the Minkus New World-Wide Postage Stamp Catalog (which rivals the Scott catalogue in depth and quality), and editor of the Minkus Country and Regional albums. His stamp acumen and knowledge is apparent on every page of the Supreme. But the Minkus brands always played second fiddle to Scott in the United States, and today the Minkus catalog numbers are essentially dead. And no doubt that was the intent of Amos/Scott in 2004, when they acquired the Minkus/Krause holdings. Fortunately, Amos saw the wisdom of returning the Supreme to print, or "print on demand". The problem we WW collectors have is, how, in a reasonable way, are we to house our collection? Putting stamps into stockbooks is popular in Europe, and with some U.S. collectors. But, leaving aside that choice (and it may be the right choice for many! ), let's look at the realistic possibilities for WW coverage using manufactured album pages. I see these major choices, at least for the Scott-centric stamp world. Many great collections have been housed in the Scott Specialty pages. Not all parts of the world and countries are currently available. Generally, will take a considerable shelf volume, and newly manufactured pages are expensive. If one's aim is to have a WW collection of such scope that it will eventually be handled by one of the major auction firms, then this might be the right choice. Steiner WW pages "Too Hot"? But, for many WW collectors, the comprehensive coverage may be too much. Too many empty spaces, unless one already has a substantial collection for a country. I think, unless one's collection for the classical era is already 20,000 stamps or greater, the pages will overwhelm the collection. I have 40,000+ stamps mounted for 83,000+ spaces; yet many pages show a few stamps swimming in a sea of empty spaces. Not a good look. And what about expense? This is a hobby for me, not a wealth portfolio. Then there is the space requirements. Plan on some 8-10 feet for the 44 1 1/2" binders. Some of the same arguments can be made for the Scott/Vintage 1840-1940 six volume "Big Brown" albums. They also offer a space for every stamp issued. Comprehensive is not necessarily good, unless one already has a lot of stamps, and a healthy budget. In addition, the stamp space identifications are frozen in time to reflect the Scott catalogue of that era. But, because of greater density of stamps per page, space requirements should be less than the Steiner. And, this choice is still quite popular among WW classical era collectors. If one doesn't mind collecting to the album - as there are probably 10,000 more stamps that could have been included- and watermarks and perforation differences are not that important, then Big Blue is the one! OTOH, if the above restrictions and simplifications annoy you, then look elsewhere. And that brings us to the Supreme. Well, you might ask, why is the BB blog looking at the Supreme now- doesn't Jim already have 40,000+ stamps mounted in Deep Blue (Steiner)? But curiosity got the better of me, and perhaps a whiff of fresh grass from the "grass is always greener elsewhere" tendency that I am sometimes susceptible to, so I ordered a new set of Minkus Supreme 1840-1952 pages from Amos last month. Could the Supreme indeed be the "Goldilocks" album for WW classical era collectors? As a bonus, the Supreme covers all countries to 1952 (actually 1953-54 in some cases). Since I recently have become interested in expanding the collection to include WW II and aftermath, that particular feature was attractive. Update: The "1954" Part I 1840-1952 edition sold by Amos is, in fact, not the original 1954 edition. It has been enhanced in some cases with additional country coverage. Specifically, the enhanced pages for the country included in the 1957 supplement are there! Conclusion: The Part I 1840-1952 Minkus Supreme edition sold by Amos now is, at the very least, enhanced with country pages included with the 1957 supplement. No Minkus numbers in the spaces. O.K., but how to evaluate? So I took my early USA, put them in the respective albums, and scanned the results. Note how Steiner includes the seven major Scott numbers (types) for the 1851-56 1c blue "Franklin" imperforate, and the four major Scott numbers (types) for the 10c green "Washington" imperforate? That coverage would be perfectly acceptable for a comprehensive or specialized collection of early USA, but for a general WW classical collection by collectors of ordinary means? Overkill, in my view..."Too Hot". 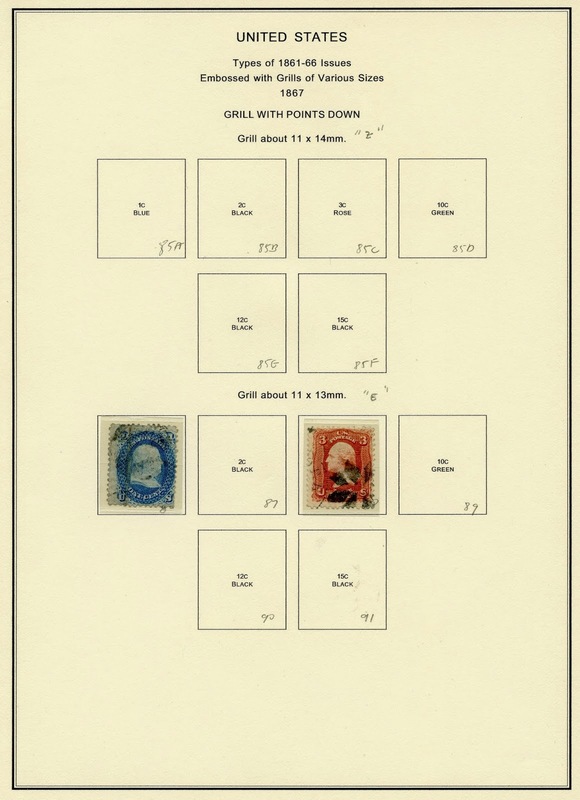 Page two has seven spaces for 1c blue "Franklin" types, six spaces for 5c brown "Jefferson" types, and five spaces for 10c green "Washington" types. 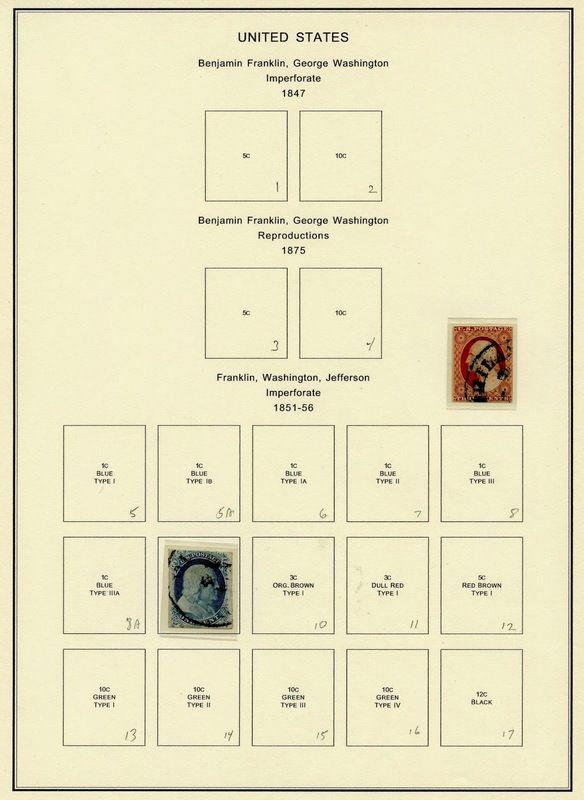 The coverage of the "F" grills look O.K., but the 1875 "Re-issues of 1861-66" stamp space coverage (CV $Thousands), is probably not for the WW generalist. Note how lonely the stamps seem to be, swimming in a sea of blank spaces? The coverage looks generous for the WW classical collector, but possible. Note Steiner here offers relatively few spaces for the page- a general characteristic of Steiner pages. Nothing wrong with that, except it will require more pages, and more volume (bulk) to cover the classical era. Now, I know that an early USA collection is particularly difficult, even for USA specialists. But, truth be told, it is not a good look. Is there a better way to show off the USA collection? As Big Blue started out as a "Junior" album, the question, compared to the Steiner, is entirely different: will it offer appropriate spaces and enough spaces to satisfy most WW classical collectors for USA coverage? Still, I definitely prefer this presentation as a WW generalist. But let's look at the particulars..
* Only three spaces for the 1851-56 imperforates? One could argue it should be more. * Only three spaces for the 1857-60 perforates? I wouldn't mind more. 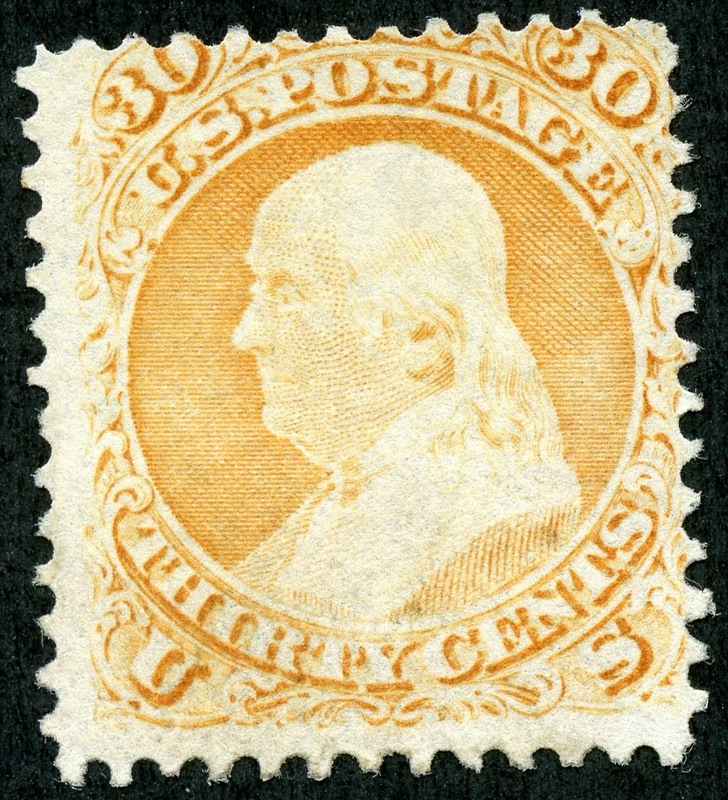 USA Scott 71 30c orange "Franklin"
*The 1861-67 line is completely full with stamps in BB. But clearly, BB doesn't provide enough spaces, as even my meager collection has the 30c orange "Franklin" without a space. The next line (seven spaces) is for grilled stamps. I think the coverage is actually too generous. And why would BB specify a grilled version of the 1867 Scott 98 15c black "Lincoln" @ $300, rather than the ungrilled 1866 Scott 77 15c black "Lincoln" @ $180? *1869- coverage is appropriate, if not generous. What does the Supreme have in store for us? I like it! But before we consider specifics, lets glean some general impressions. *Paper is white tint, thick, and has the feel of lighter card stock. Even if stamps are in mounts on both page sides, the paper should be adequate. * Lots of stamp images. 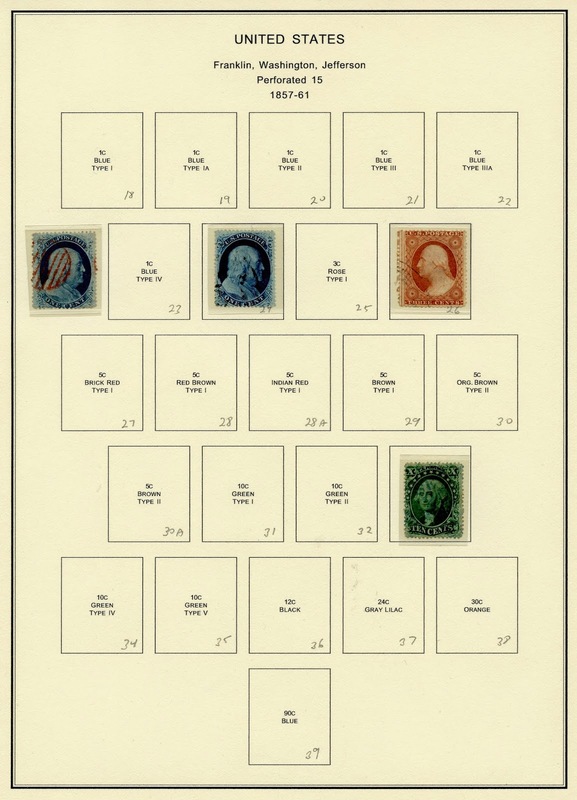 In fact, the Supreme is quite generous with stamp images, which certainly makes it easier to locate the right space. And one of my concerns was if the Supreme has room for mounts (for the more expensive stamps) within the stamp spaces that are provided? So far, it appears so, although I try to use the smallest mm high mount that fits the stamp, and trim the sides close to the stamp when using the Scott (Prinz) mounts (split-backs). Someone recommended Hawid mounts (open top), which can be trimmed on three sides, although I have no personal experience with them. * And note that, for the same 1847-1869 USA coverage, the Supreme has 40 spaces, compared to BB's 29 spaces. Multiply that increase across pages and A-Z countries, and the Supreme might very well be the "Goldilocks" album many WW collectors are looking for to house their classical era collection. 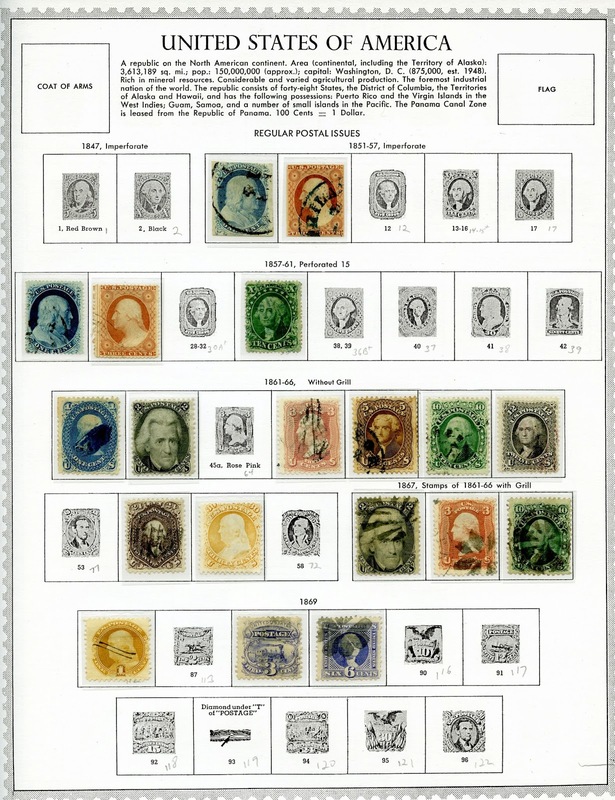 * Note the spaces for an issue are expanded- two more spaces for the 1851-57 imperforate issue, four more spaces for the 1861-66 without grill issue, and four more spaces for the 1869 issue, compared to BB. Also note that the 1861-66 without grill issue and the 1869 issue are essentially complete to the highest denomination- in other words, a complete set. That is another general characteristic of the Supreme that applies to all countries: offering more coverage of sets, even to the point of completeness. So what about those 10,000 more stamp spaces that the Supreme might have, compared to Big Blue for the 1840-1940 era ? Some (half?) certainly are the watermark varieties and perforation varieties that are major numbers, and other inexpensive stamps and categories that Big Blue ignores. Others, though, might be the more expensive stamps that one finds for the higher denomination values for an issue. 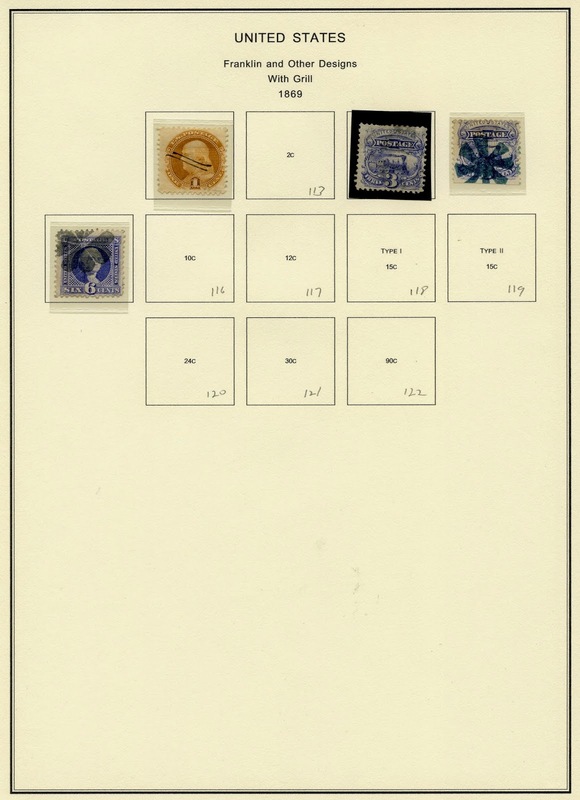 * What about the quality of the stamp image itself on the Supreme pages that Amos now sells? Unfortunately, they often appear to be a "Xerox of a Xerox"- P-O-O-R !. I noticed that some 1960+ published era Supreme pages I have for a feeder collection have a clearer stamp image than the ones now on the pages Amos distributes. And the image is important, because as most are aware, Minkus mixes and matches regular, air mail, special delivery, semi-postal etc categories on the same page. But, truth be told, I have been able to eventually identify (by Scott number) any stamp image in the Supreme that I have attempted. So, although the image may be poor, it is not impossible. * And note those numbers in the stamp spaces for the USA? Those are not Scott numbers (ignore the Scott numbers I have written in pencil), but Minkus numbers! Previous 1960+ era edition Supremes had the Minkus numbers in the spaces for all countries, but the version Amos now sells does not. Unfortunately, Minkus numbers are now "deader than a door nail" in terms of buying/selling with dealers or other collectors. If one obtains a Minkus Supreme, I recommend scouting out a page, and identifying all the stamp spaces by Scott numbers. This will require some flipping back and forth in the Scott catalogue, because regular and BOB are mixed together on a Minkus page. Actually, what Minkus does is the catalogue norm in much of the world, as Michel does this also. Now this (using a Scott catalogue) should solve 95-100% of the stamp space identifications. For the rest, though, it is nice to have a Minkus catalog handy to solve any conundrums. I have a 1975-76 Minkus WW Volume One, which covers the Americas, the British Commonwealth, and the Free States of Africa and Asia. My 1974-75 WW Volume Two covers Europe and Colonies. I don't want to minimize the Scott/Minkus hassle that one will need to deal with if one is truly interested in using the Supreme. It is a hassle. But the Supreme may be "worth it", in my opinion. So what is the verdict on the Supreme? I think many WW classical era collectors would be ultimately pleased with the Supreme, provided one can get over the Minkus/Scott catalogue translation. For myself, I've come to a few preliminary conclusions. But I've only been pondering about this for a month or so, and I may change my opinion. It appears to me that the Supreme is the best compact solution for the intermediate WW classical era collector who would like to house their collection in an album, provided that collector is interested in watermark/perforation varieties. I think of the Supreme as a "Super Big Blue". And let's be realistic- the same problems with not enough or adequate spaces for a country will also be found with the Supreme: I believe, though, less than Big Blue. Big Blue might still be the best choice for "face only" collectors, those that would like to collect to an album with the goal of mostly filling the album, and those that don't like spaces that are expensive. As far as using the Supreme for my 1840-1940 collection, I already have 40,000+ mounted stamps in Deep Blue (Steiner), and, for the most part, I still like the Steiner. There is a possibility that I could move some of my less developed countries into the Supreme from the Steiner. Then there are countries (I'm still discovering them) where the complications (Argentina-watermarks) are too great for the Supreme, and the Steiner is a much better choice. I would be happy to hear your experiences with using the Supreme, or answer questions, if I can, about the Supreme version that is available from Amos. 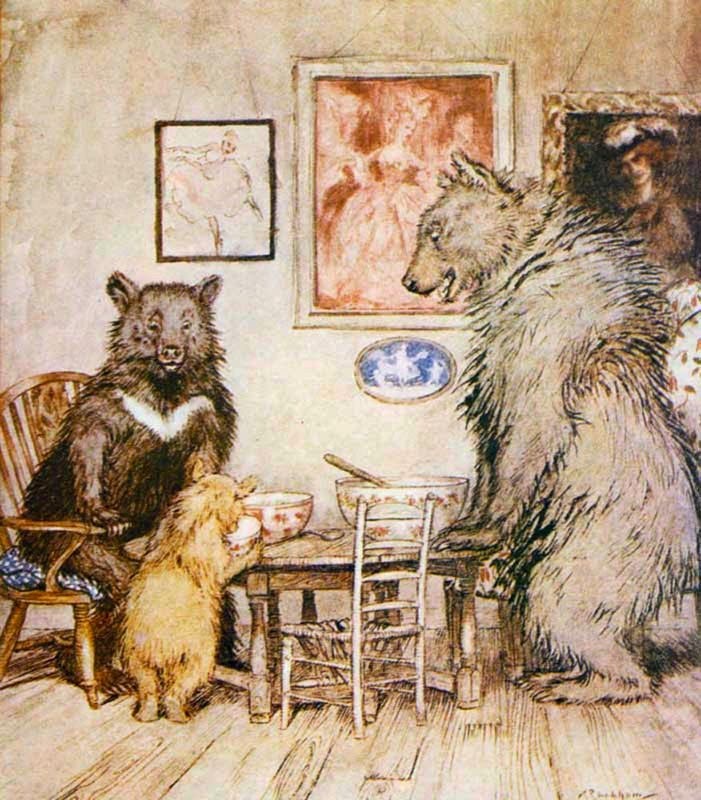 Note: "Goldilocks" Fairy tale story images appear to be in the public domain. 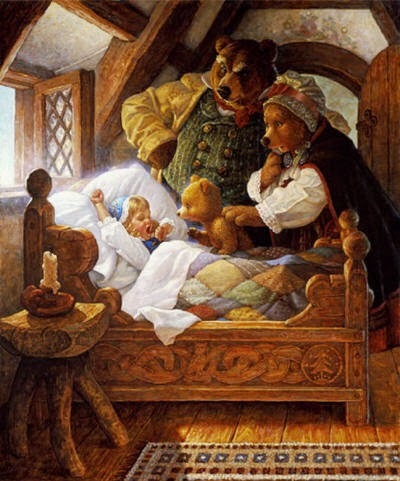 The Goldilocks story quote is from the dltk-teach.com web site. This is great! Thanks so much for this post; I really appreciate it since I have been ‘on the fence’ regarding these three album options for more than a year now. 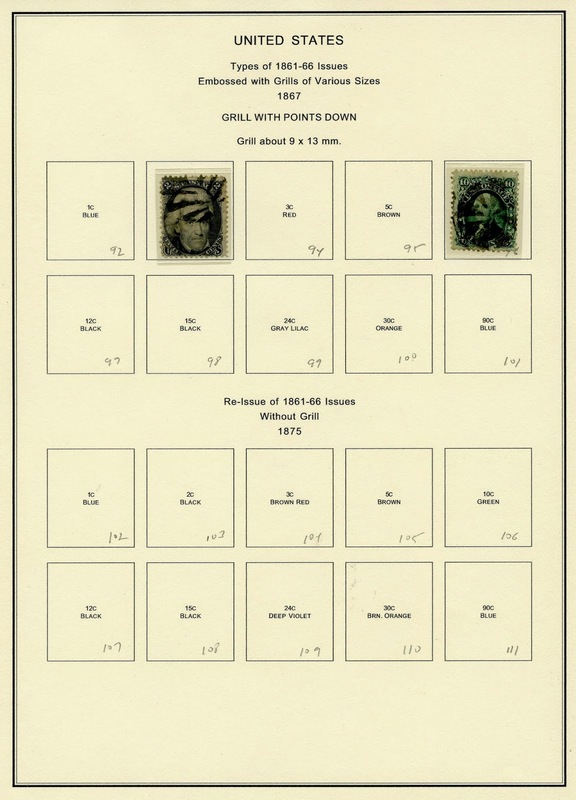 Your comparison using the early U.S. stamps really says it all regarding Steiner pages…what a difference! Through yours and Bob’s analyses, I think we now have a good idea in the differences in coverage for various countries between BB and MSG. Now, what I’m interested in is how many (and which ones) countries are in the Minkus that were completely eliminated from the later editions of BB. Perhaps you could address that in a future post?
" Now, what I’m interested in is how many (and which ones) countries are in the Minkus that were completely eliminated from the later editions of BB. Perhaps you could address that in a future post?" Yes, that does sound like a good topic. "It appears to me that the Supreme is the best compact solution for the intermediate WW classical era collector who would like to house their collection in an album, provided that collector is interested in watermark/perforation varieties." I think you hit the nail on the head with this statement and fits me well where I am in my collecting. Really well written review, thanks. I've looked with interest on this album as well, and if I ever start up a classic WW collection, this may well be the album I go with. What size are the pages? Will they fit in Lighthouse Vario-G binders? "What size are the pages?" I measure 9 1/2" X 11 3/8". "Will they fit in Lighthouse Vario-G binders?" Yes, I have some Vario-G's, and they do fit- snugly. What an interesting post! Since retirement, I've been trying to decide to just update/expand my Senior Statesman or go with new Odyssey. I've read, though, that the new albums have mostly newer issues, so there goes my older stamps, and vice versa. This post made me think about maybe dividing my collections into "earlier" and "later" albums with a Denmark Palo as a specialty. Very interesting and I like the looks of the Supreme layout. Thank you so much for also writing with the casual as well as top tier collector in mind! Looking forward to more articles from you! Rick- If you are interested in the 1940-1952 era, either the Supreme or Big Blue (Part I & II) might interest you. Big Blue is easier for collectors, as it is tied to the Scott catalogue, and I am constructing a checklist for the spaces. The Supreme offers more spaces, but the collector has to work at it more to identify the spaces. Good luck with your retirement and your stamp hobby! 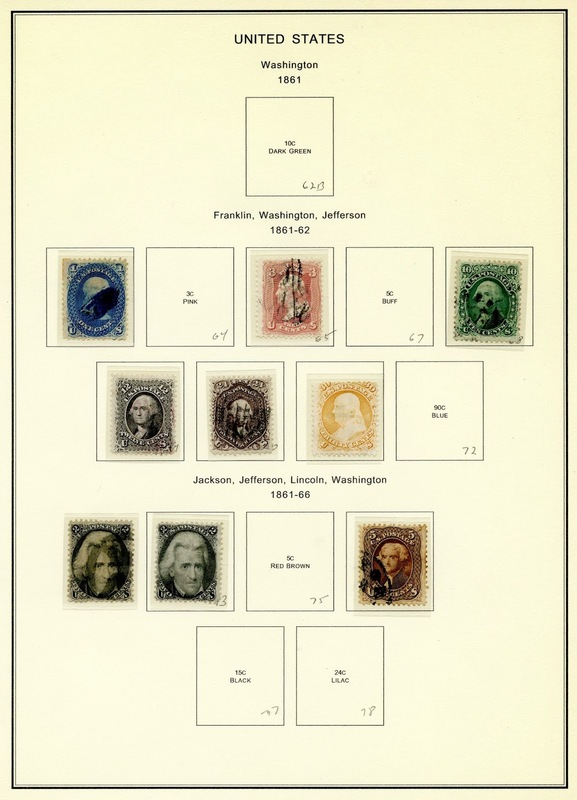 I’ve also been using BB for my United States stamp collection, and this, coupled with its relatively compact layout, doubled-sided pages, elimination of the most expensive stamps (dollar value Columbians, 1930 Zeppelins, etc. ), and consolidation of the many water mark and perf varieties of 1912-1931 definitives makes this especially tractable. More importantly it’s nice to look at, especially since I began using transparent interleaving in place of glassines. In my opinion collecting by Scott number just doesn’t make sense for most collectors, since separate numbers are often given for what I would consider to be perf errors, and even plate position varieties. 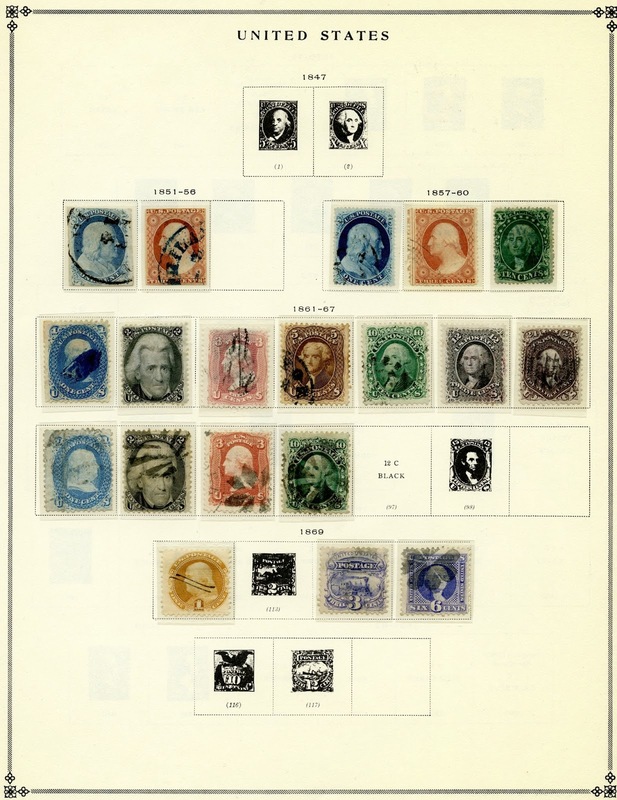 Regarding the first US page for BB, my plan is to simply continue the 1st row for the 1861-67 stamps onto the 2nd to make room for higher values, and use other spaces in the 2nd row for the grills (hopefully examples that clearly display the grill through to the front of the stamp). Since I use black mounts for these, who’s to know… Also, using mounts allows one to take advantage of the extra space provided in BB. For example, there should be room for higher value 1869 pictorials if needed. There is also some additional space around the 1851-60 issues, although this will require more creativity. While I still use my Minkus SG album for later stamps/duplicates and do like many of its features, over the last few years I’ve come to prefer the BB. This includes BB’s more generous space for using mounts, a preference its cream-colored pages over white for Minkus and annoyance at the superfluous presence of spaces for flags and coats of arms at the beginning of each country for Minkus. I’ve recently been working to overcome some of the limitations of BB’s arbitrary cutoff at 1940 by selectively adding a few Vol. 2 pages plus blank pages for certain countries (such as Germany). Nonetheless, I really liked the pictures showing the new Minkus SG pages, and if $, space and time were not an issue, I’d be tempted. My overall concept is to develop a relatively compact WW collection that I can enjoy into old age. By design, it’s strictly a hobby collection and I never expect to fill all the spaces and complete it. Wow! I really like how you use your BB, and you make an exceptional argument for enjoying the positive attributes of Big Blue. For myself, I think I sometimes lose the forest for the trees. "My overall concept is to develop a relatively compact WW collection that I can enjoy into old age." Great post, Jim. I'm loving the comments too. I love the analysis based on how full the pages look, and could possibly look. I never really considered the how sparse the Steiner pages could look even when one is fairly deep into a country. If I were looking for an album, I have to think I'd seriously consider the Minkus album. However I think I'll focus on making my stockbooks more 'exhibit' like before I plunge back into paper. This is one of those posts that I will reference for a long time to come. Thank you! I probably took one of the worse case scenarios for Steiner (Early USA), and made it look bad- which it does. ;-) Steiner does look better the majority of time- as long as there are enough stamps on the page. I've realized, though, that I appreciate having lots of stamps on a page. That is the particular strength of the Supreme. I actually prefer the sparser layout of Steiner pages for country collections as I end up with more *full* pages as compared to a page with 2x or 3x the number of stamps on it. I think having more full pages enhances the overall presentation of a collection. However, the number of Steiner pages grows too large and unwieldy pretty quickly if one wants to collect the entire world. I'm currently focused on a few countries at the moment, but I'm still a WW collector at heart. At some point over the next few years I'd like to get back to general WW collecting, if only as a sideline. If Amos is still selling Minkus pages by then, this will probably be the album I'll go with. You are right about Steiner getting too bulky if one collects the world. I've capped my Steiner pages for the classic years (1840-1940), and plan to use the Supreme after 1940. Like you, I like the Steiner pages if they have stamps on them- but my collection has grown in size about all I want and the Supreme is a great compact solution. Many thanks for this excellent discussion. The Supreme Global edition reprinted by Amos first appeared, as you say, in 1954: the earliest advertisement for it in the New York Times was on 24 October 1954. (I've found it's possible to follow the full history of the albums pretty easily if you have access to the online version of the NYT.) I'm sure the reason that Amos selected this edition is almost certainly because it is the easiest to supplement, and the Part 2 1953-1963 pages are presumably made up from the relevant supplements. If true that would be good news, as they are generally very comprehensive for those years. The revision in 1959 of the Supreme Global compressed some of these pages (though not a lot) and made other corrections and changes, including adding Minkus numbers throughout. This was possible as a the result of the completion of the Minkus New World-Wide Catalog. Although I regularly other catalogs, including Scott, I tend to work from Minkus directly as that is my main album. My impression is that from the time the Supreme Global appeared in 1954, Minkus issued 'Global' supplements intended for both the Master and the Supreme. These usually appeared in the Fall. Thanks James for your extensive comments, and that does clear up (for me) some of the Supreme unknowns. I am glad that you speculated that the 1953-63 pages are probably quite complete. One of the attractions of the Supreme is the combination of reasonable completeness and compactness. That is a major reason, with the expansion of my collection from 1940-1960+,that I will house this period in the Supreme. Thanks for pinning down the Supreme revision year as 1959 when Minkus numbers were added to all the spaces (because of completion of the catalog), and some page revisions were made. I noted some of my feeder pages from the Supreme of this later era do appear to show changes. I agree that the Minkus catalogs and albums- and yes, they are very good-, could have served a larger role today if the circumstances had changed. Having restarted my collection a few months ago (largely thanks to this blog), I just purchased a new vol.1 of the four volume Big Blue. I've been using the Steiner (love it) but realized that there would be no way I could get a world wide collection of pages into all the necessary binders. I almost bought the Supreme...but I don't like the white pages and the layout is just too crowded. I can use Steiner or specialized albums for countries that I want to really dive into. I think the Blues will be a good place to spend a few minutes each evening filling spaces. The Brown reprints were enticing, but the cost seemed rather extreme..plus they definitely end at 1940. I plan to add international pages to 1950 or 1955 to my internationals. So there you have it. Joseph- Using BB and a selected number of Steiner pages if necessary is a great plan. Should work well! I traveled a very similar path as you. I have a 2-volume BigBlue housing my main collection, but got frustrated with the lack of coverage. I started using Steiner pages more than a year ago, but came to the same realization as you did. Then, based largely on this blog post, I came very close to buying the Minkus Supreme Global, but didn't really like the white pages and overcrowded look. Plus, I also really didn't like all the 'back of the book' stamps mixed together with the regular issues. So, I ultimately decided to take the plunge (slowly) with the Brown reprints. I just ordered the Vol 1 covering the 19th century, which is particularly weak in the BigBlue. I will try this out for a while and see how I like it. Then, I will either use it as a separate 19th century collection and keep everything else in my BigBlues or, if I really like it, I will just slowing purchase the other volumes over time. And, either way, I will ultimately get the Scott International Vol. 2 to cover the 1940's. Gook luck with your collection! How is the Minkus coverage of British colonies? I've gotten the impression from fleeting comments elsewhere that the supreme omits a lot of early issues (like the Britannia stamps for Barbados), but I've never had that verified. Are there any spaces provided for the 1857 - 1867 issues for Ceylon? Or what about early issues for St. Helena? I would say if you have a serious interest in the early issues of British colonies, then neither Big Blue or the Supreme would make you happy. Clearly, only the Steiner gives good coverage. But these early stamps are fairly expensive to quite expensive, as only 22 stamps of the three countries cited have CV <$10 out of 158 stamps. Therefore, "representative" albums such as Big Blue and Supreme (who tend to provide spaces for the less expensive stamps) do not provide much coverage here. Thank you for the response! I'm not a big fan of the Steiner pages for two reasons. I think the Steiner coverage is too hot, and I think he has too few stamp spaces per page. I have 51 out of the 158 stamps discussed above. With 107 blank spaces spread out across several Steiner pages, those 51 stamps look like islands in a sea of white space and that makes the collection as a whole look anemic. I really like the layout of Minkus. I just wish the Minkus album was a bit warmer. Don't forget about the possibility of using the more comprehensive Minkus specialty pages for countries that you want deeper coverage. Subway sells many of these and, of course, there's eBay. These can be mixed right in with the MSG. I'm wondering if the countries in the Minkus reprint start on new pages every time. I'm sorry to bother you with this, but AmosAdvantage told me three different answers! No, yes, and I don't know. Seriously, don't they want to sell their products? OK, I'm done venting. Appreciate your work on this and all your articles. It's really helping me get restarted collecting. cchutt- no problem, ask away with any of your questions! Most of the countries start their own page. This is especially true for countries that continue with stamp production, and were not a "dead" country. But, no, the smaller country entries- especially "dead" countries with no more stamp issues-and have only several lines for spaces on a page may share the page with another small (dead) country or countries. The Supreme reprint (I suspect the original was published in 1954) covers from 1840-1952+ and the reprint is identical to the 1954 original in layout. I think I'm hooked on a side hobby; collecting old stamp albums! 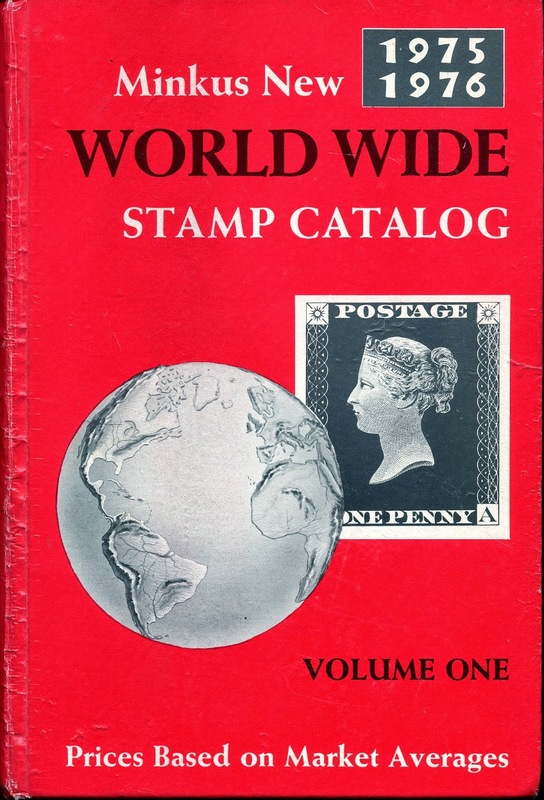 I recently bought a 1958 copy of Minkus Comprehensive World-Wide Stamp Album. I was surprised to find the countries are not in alphabetical sequence! Then, in the hours since I posted the above comment, I bought a 1957 copy of Minkus Supreme Global from a local dealer. I am expecting delivery soon of a 1942 Schaubek world wide album and a 1933 Scott International Junior. The MSG is very nice. Apparently, Minkus didn't start putting their catalog numbers into the albums until 1958. For the Comprehensive, it has what I believe to be a supplement from 1958. It has the catalog numbers. I'm getting quite a kick browsing through these different albums. That '57 Supreme should be close to what amosadvantage now sells as a reprint. As far as Minkus numbers in the Supreme, you are right. The 1840-1952 reprint does not have numbers, but the 1953-1963 Supreme reprint from amosadvantage does have Minkus numbers in the spaces. Can you do me a favor and look to see if your first page of Turkey (Ottoman Empire really) in your MSG has spaces for the 1863 Tughra issues? BigBlue does not, and I purchased a couple during my summer trip to Turkey. No, the MSG starts coverage with the 1865 issue. Ok, thanks for checking for me. They are indeed a nice trade-off, and I am putting my secondary 1840-1940 collection in them, and my primary 1940-1960+ collection in them. "secondary 1840-1940 collection"? I assume this is your duplicates? I'm enjoying my Vol 1 of the Vintage Reproductions, but, of course, that only covers the 19th century. I'm not relishing the thought of buying the other 5 volumes! MSG is still in the back of my mind. The Browns/Vintage are nice and a good investment for your hobby- I would think you would not be disappointed. The only thing is you may have to do is a little editing of the spaces to bring them more up to date with the current Scott catalogue. Quick question regarding the MSG. I realize that the "BOB" items are mixed in with regulars date wise, but are they labeled as "airmail" "semi-postal" etc.? I recently bought a stamp lot on (old) Minkus pages, and they were labeled as such. Not sure of the copyright year of my pages though. No they are not. They are, however, often on the bottom of the page layout, so that is a clue. OK, having not read trough everything here, but have a laymans question, here goes. I have a few volumes of the Minkus global supreme stamp books. They are filled with pages. Volume 1 has a copyright? date of 1966, volume 5 is 1975. I thumbed through 1 quickly, there are a small handful of stamps in it. I really have not checked the rest. These belonged to my father, and sort of the last thing I am dealing with, as it is difficult to really get any information out there, and not really any shops. There is also a box filled with stamps, that I know some of which will go into these books. Any help as to value or anything at all would be helpful as my husband basically wants to trash them says not worth the hassle. I sell on ebay and would put them on there, but with lack of knowledge, not sure what to do with them. Thanks! Hello Gizmos- I will give you several alternative ideas what you can do with the Minkus and the stamps..
- Your Husband might be right, the chances are it is probably not worth much- sad, but true. - If you have a stamp club in the area, look them up and bring the collection to them for advice, or let them dispose of it. - if you have sold things on eBay before, and can do it easily, you can list it with some pics and see what you get- who knows, perhaps the results will be surprising. Good Luck! Thank you for this thread - Can someone recommend a good not to expensive three ring binder to fit the Minkus SG pages - not too tightly - I guess about the same dimensions as the binder sold by Minkus for the SG. Thanks again. John - I use, for the present, some 1 1/2" binders (Avery)from Staples. They are just large enough to cover the Minkus SG pages, but not more. ;-) But they do work. Thanks Jim. I will check out the Staples in our neighborhood. I believe, George A. Tlamsa is more correct. Otherwise, the account on Minkus and the album is superb. Love your blog Jim.... I haven't been a "generalist" yet but have a mix of 1947 BB and Steiner pages for my interest areas. Now you have me pondering MSG...hmmm. I like Steiner, I like BB, and I like the Supreme - they all have different strengths. I received a Minkus ww album, not a Supreme or even a Master, more of a starter album really, when I was a kid. Vintage is around 1964, but have added supplements over the years, both forward as far as 1988 (don't really care to go further) and backward as far as 1952. Yes, someone had a 1952 Supplement on Ebay and I got it! I'm only missing the 1953 supplement to have a complete set of ww supplements (through 1988, of course). I checked Amos again today after reading your article, but they don't sell individual years, apparently. Why did I never upgrade to Scott Browns or MSG? Time. And money, but mostly time. So, my early collection is a VERY quirky hodgepodge of original pages and extra quadrilled pages in between, and then the supplement pages, which take up a huge amount of space because Minkus spaces the stamps out much more in the supplements. What I LIKE about the Minkus album is how it groups countries with their related states, colonies or possessions, for example French colonies after France, and so forth. Of course, this philosophy is, due to our turbulent history, fraught with great difficulty, and Minkus's decisions are not always consistent, but oh well. I've been collecting since I was 7, just for fun, and it's been a great ride so far. Thanks for the great story about your Minkus album, supplements, and collection. I like the fact you have been collecting since age 7, and it continues to be fun! Hi Jim, after going through the archives here and on Bob's blog, I really liked the idea of getting a Minkus Supreme album off of eBay, and using it for my dups and for those stamps that have a space in the Big Red, but not Big Blue. I really like the album. It goes a bit overboard compared to BB in the British Colonies and GB, where it has the same set several different times with different watermarks or perfs, but frankly that's a huge part of the hobby, and perhaps helps to turn those who are "stamp collectors" into "philatelists"! I was fortunate to find an album that is in GREAT shape...just wish I had the other half! Love the thicker pages compared to BB, but listing all of the BOB items intermingled with other stamps in the same year or range of years is a major difference. Ray - enjoyed your odyssey into the Minkus Supreme. I too am using it for dups of the 1840-1940 period. And, after 1940 (-1952 for British Commonwealth), it is my primary album up to 1969. Darn, too bad you only obtained 1/2 of the Supreme. Perhaps most likely there will be more showing up on the "Bay. I will also keep a lookout..
Wow, that was quick. have fun!